By: John M. Tidd, Psy.D. Realize that every couple is unique in their starting place and some may need a professional to help them achieve their goal of healthier communication. If you feel you would like extra help in your relationship or you have any questions about the above model, I would be glad to help you. 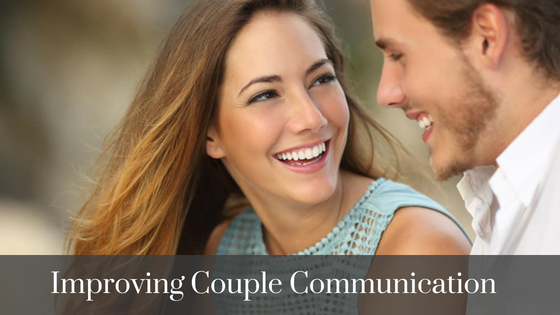 Many challenges arise when couples try to effectively communicate with each other. For example, every person has a different upbringing that may impact their perspective as well as contribute to their varying communication styles. If you’re struggling to try to improve the communication in your relationship, you’re not alone. Given the fact that there are so many unseen factors at play when approaching a conversation with your significant other, feeling frustrated in trying to get through to one another is not uncommon. Implementing a few simple exercises to improve your relationship communication can make a world of difference. As a relationship psychologist, I help couples to communicate more effectively and to connect on a deeper level. Depending on the couples needs we will work through various exercises. Below is one of them that I have found effective in helping to strengthen communication between couples. Remember to pick a quiet place to talk (no distractions, no technology). This process can feel awkward at first, but with practice, it can become more comfortable and can be highly effective. Start with an open mind & share your thoughts & opinions with humility. Another important thing to be aware of while communicating with your partner is that “the message sent is rarely the message that is received” In conversation, there is a sender and a receiver, and the roles get reversed as the dialogue progresses. Be sure to fully listen and be patient in the receiving role as this will help in fully understanding the message that is being given by the sender. Know that you may not always agree on the end result but if you shift the focus from finding agreement to finding common ground it will help each person to feel better listened to and understood. While in conversation also understand that agreement is a goal of the conversation but not necessarily a requirement. This will help to ensure that your goal of communicating is not trying to prove your point but also to hear your significant other’s point of view and take it into consideration. It also communicates that you validate and acknowledges what the other person is saying even if you don’t 100 percent agree. Also, be aware of the fact that every message has room for truth and error. Understanding this will allow you to keep an open mind to accept new information as well as, it should remind you to remain humble when presenting information. ← What is the Difference Between ADD & ADHD?